How can assessment results from Education Perfect be fed back into Canvas? Results from assessment tasks you assign in Education Perfect can be fed back into Canvas' gradebook, making it easy to collate assessment results from multiple sources. What types of assessments can be included? Any assessment created in the Control Panel (including Quick Tests) can have its grades stored in Canvas as well as in Education Perfect. Create a Quick Test or pre-built assessment in the Control Panel. From Canvas's Assignments tab, add a new Assignment. Give it a title and type any information you'd like students to read before launching the assessment. Under Submission Type, select External Tool and paste the embed link from Step 2 into the box. Tick Load this Tool in a new Tab. Configure the rest of the assignment as you normally would (see Canvas's help site for more information). 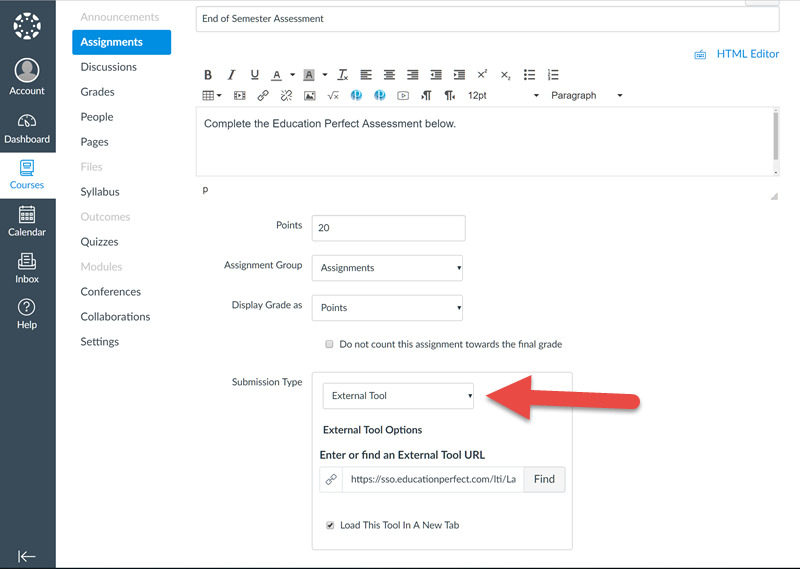 If an assessment is created in the Control Panel and assigned to a single student, and the Canvas assignment is made available to everyone, only the student who has been assigned the task in the Control Panel would be able to start it. If an assignment is set up in Canvas to be available from 8am to 9am, and the assessment in the Control Panel is set to run between 10am and 11am, students wouldn't be able to start the task there.